Here are Cody Winfrey’s top five picks for cocktail making of late. • Dark Jamaican rums , like Myers’ or Whistling Andy Hibiscus Coconut Rum from Montana. Blend orange vodka and Blue Curacao with ice. Neatly pour or spoon blue mixture into glass, then place in freezer to keep layers separate. Blend Midori, pineapple juice and Malibu with ice. Neatly pour or spoon the green mixture into glass, then return glass to freezer. Blend spiced rum and grenadine with ice, then neatly pour or spoon red mixture into glass. Garnish with a strawberry or Swedish fish. Maleficent might get you tipsy. Cody Winfrey not only wears his love for all things Disney on his arm, home to a few Disney-themed tattoos; he serves it up from behind the bar. 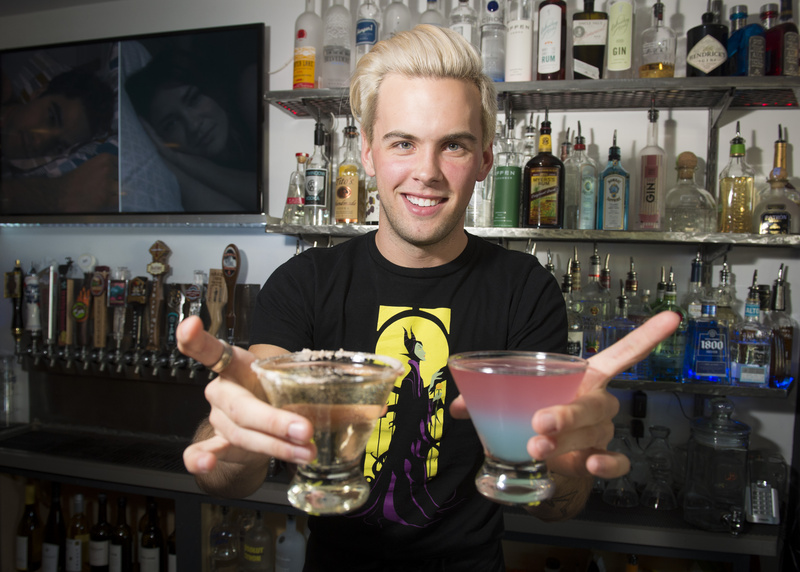 The Spokane bartender is the creative force behind 46 different Disney-inspired drinks, which caused quite a stir when he began posting photos of them on Facebook earlier this year. Although the specialty cocktails aren’t on the menu at Chairs Public House, where Winfrey now tends and manages the bar, customers come in just see to the man behind Cocktails by Cody. And he’ll mix up a Lost Boy or Crazed Captain, inspired by Peter Pan and Captain Hook – or any of his other Disney-inspired drinks – if they ask. The Rapunzel-inspired drink – with St. Germain, pear vodka and Champagne – is one of his favorites. He calls it Lily of the Sun. “It’s floral, light, bubbly, a little sweet. Delightful,” he said – like Disney. The 2009 West Valley High School graduate had planned to go to college for photography in Seattle and pay for school, living expenses “and the whole American dream” by bartending. “Bartenders seemed to make more money and have more fun” than hosts or servers, Winfrey said. “The only advice I was given” – by a former co-worker and mentor whom he calls his “fairy drunk mother” – “was go to Idaho, buy a bunch of alcohol and practice – and write everything down,” said Winfrey, who estimates he spent two years and about $4,000 on alcohol to teach himself the tricks of the trade. However, with no formal experience, he didn’t get any calls back for all of the bartending jobs for which he applied. So he kept on working as a host at the Applebee’s in Spokane Valley. “You can be as self-taught as you want and no one will look at you,” the 23-year-old said – that is, of course, unless you do something to make yourself stand out. He blended his love for Disney with his passion for bartending and started creating: the Red Queen, inspired by the Queen of Hearts, with citrus vodka, blood orange vodka and blood orange juice; the Fairy Dust, for Tinkerbell, with cider, honey vodka and Triple Sec; the Bone Daddy, inspired by Jack Skellington, with Apple Pucker, Butterscotch schnapps, cider and Hennessy; and The Glass Slipper, inspired by Cinderella, with blueberry vodka, whipped cream vodka and cream. Maleficent is black vodka, grape schnapps and Apple Pucker. Evil Step Mother is chocolate vodka, pomegranate juice and chocolate liqueur. The Lost Boy is Midori, Malibu and peach schnapps. And the Crazed Captain: Spiced rum, Midori and Bacardi 151. The hope was to generate some buzz, land some freelance bartending gigs at private parties or events, and maybe find a more permanent job. Instead, he became somewhat of an Internet sensation. With the help a graphic designer friend, he launched his Facebook page in January, posting photos of his colorful concoctions alongside images of the Disney characters which inspired them. It has more than 38,000 likes. By early February, his Disney-inspired drinks were being written about on blogs, and the Los Angeles bartender who runs the Tipsy Bartender Facebook page and YouTube channel called, wanting to spotlight one of his cocktails in a video. Winfrey landed a job as a bartender at Chairs in April, about two months after his Disney-inspired drinks went viral. Now, he’s into gin. He also likes to push local and regional spirits, like Dry Fly, Blue Spirits, Wild Roots, Whistling Andy, broVo, Black Heron and OOLA. And he’s already talking about reimagining his Disney-inspired beverages as craft cocktails – and publishing an ebook. Winfrey works most Friday nights and Saturday and Sunday days. Sometimes, patrons ask to see his 13 tattoos. “Create and stay hungry” marks the inside of his left arm. Three are Disney-inspired. There’s a portrait of Maleficent, homage to “The Nightmare Before Christmas” and a tribute to “Alice in Wonderland” – without Alice. “Because it’s my Wonderland,” Winfrey said. He didn’t leave Alice out of his cocktail creations, though. Curious Confection is a triple-layered cocktail with crème de banana, Blue Curacao, Malibu and orange vodka. “I worked hard to brand myself,” Winfrey said. “I consider every drink I send out has my name on it. I’m proud of it. I want it to taste good. I want it you to enjoy it. I’m not going to send out garbage. Just don’t ask him about beer – at least, not yet.